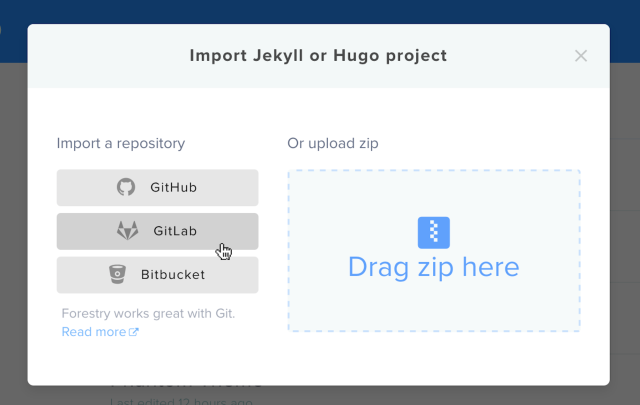 Now you can add a Forestry.io CMS to your GitLab.com static site (Jekyll or Hugo). I’ve been a GitLab user since their very first release in Oct of 2011. I worked at a design agency and converted everything over from SVN to Git and used an internal GitLab installation. I remember submitting a few bugs and Dmitriy was quick to fix them. We loved GitLab then, and still do today. We’ve watched GitLab grow since their humble beginnings to become one of the best solutions in the version control space. Here at Forestry, GitLab syncing has been one of the most requested features. Select GitLab from the list of Git services. Then Choose your repo and branch. Forestry will automatically commit changes back to your repo but you can also have it build and deploy your site (Amazon S3, FTP, etc). If you’re letting GitLab build your site, choose Commit to source repo only. 💥 Boom! Now you’re ready to rock. The Forestry CMS will commit changes back to your GitLab repo and pull in changes if you push to it. All of your content and code under version control!